Layouts will be open for tours starting at 8AM and remain open until 1PM. Some of the layouts are listed below; more will be added later as pictures and descriptions of the layouts become available (still a work in progress on that). Feel free to visit them in any order you desire on the days they are open for tour. Buses will be provided for touring these layouts. You can sign up for tour bus rides during registration for the convention (strongly recommended as seating is limited). The following are open for tour on Tuesday, 27 August 2019. The BLACK ROCK RAILROAD started in July 2015 and took 8 months to construct the basic trackwork along with the 72′ trestle. It is a fictional narrow gauge line in 1:20.3 scale that was started to haul black rock from the mines. Because of the volume of rock a small town developed. A small passing siding with two spurs to handle the traffic was added. The railroad represents early 1900 to 1930. A scratch built McKeen car handles local passenger service, as the steam engines handle hauling the freight. All motive power is battery operated with remote control by Loco-Linc. I scratch build most of my cars using poplar wood. The track is 160′ long in a L shape with 8′ curves. Open for tour on Tuesday, 27 August, 2019. The camp was inspired by a book about Westside Lumber Company in California. It includes a mill, a wigwam, a cut lumber storage shed; outhouse, two buildings for crew and kitchen, and one loop of track with 3 switched sidings. Also incorporated into the design is a concrete ravine with a small waterfall, a bridge, and a trestle. The layout is elevated two feet above ground level for easier viewing. There are approximately 30 Dwarf Alberta Spruce trees planted in double-pots, which can be removed for yearly pruning. The dimensions of the layout are 11′x15′, which is the perfect size for my design. A battery powered Heisler geared locomotive is controlled by a rail-link remote control system, which runs approximately 3 hours, with a vertical tank containing more batteries for another 3 hours of run time. The layout is in a U style, I built the tracks in a raised bed made from concrete blocks, top soil, and covered with gravel and used 1/4 minus gravel for the track. A bark chip path rests between the two tracks so visitors can walk between the trains to see all the action. I have added people, cars,truck and solar lights in my houses. It took two (2004 to 2006) years to built my dream and the train shed modeled after a real train shed where trains go into one window on a bend five foot trestle and comes out the other window on a four foot bridge. I have 500 feet of track and it is track powered. You have steps on the side of the house to walk up, so it is not handicap accessible. Home of the PACIFIC NORTHWEST LIVE STEAMERS. Visit the PNLS web site at WWW.PNLS.ORG. 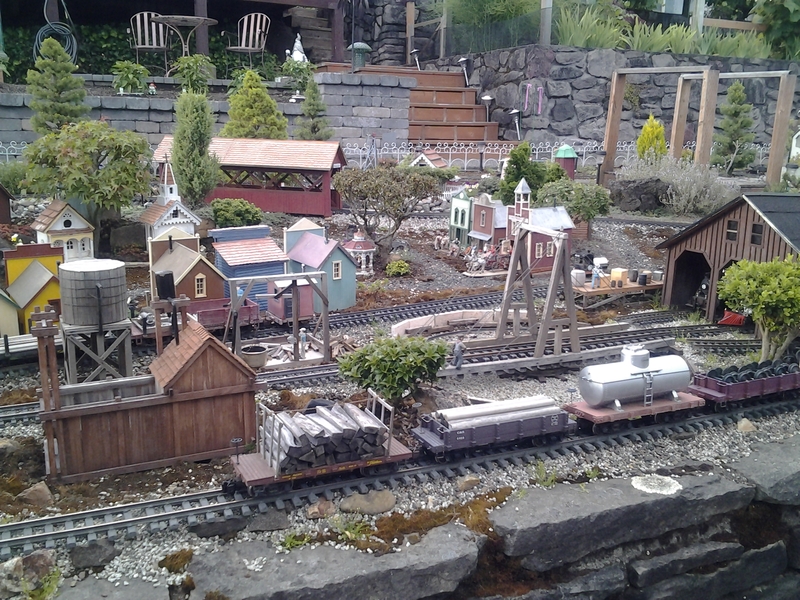 Founded in 1954 as a place for train enthusiasts of all ages to operate and ride model trains, Molalla Train Park has primarily operated with a 7.5-inch gauge layout on 4 acres of land with 4200 feet of track. The park is open to the public with a picnic area and free rides every Sunday from May through October. A large 24-stall roundhouse with railroad turntable accommodates many privately held and club locomotives, both live steam, and diesel/electric. Special events and private parties can also be accommodated. A small G gauge layout was added, and in 2017, a major expansion to the G gauge operation was begun. The layout now incorporates two loops on concrete roadbed that completely encircle the public picnic area. One loop is approximately 600′, and the other has over 700′ of track, which includes a fabulous 60′ long high trestle that spans a large pond in the center of the park. The Garden layout also incorporates a switching yard and a multiple track 7′ X 20′ storage structure. Trains use primarily battery power or live steam, but one of the mainline loops also has track power available. 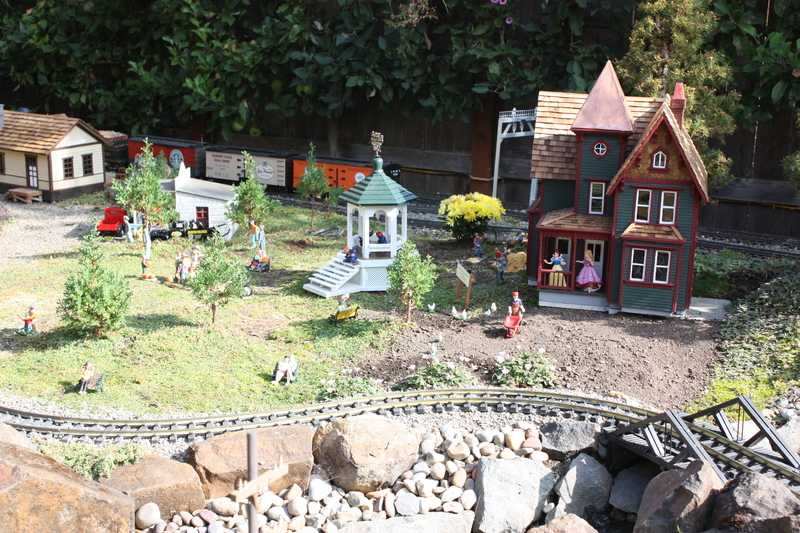 Children love seeing all of the trains run, and often are invited to operate the garden railroad. 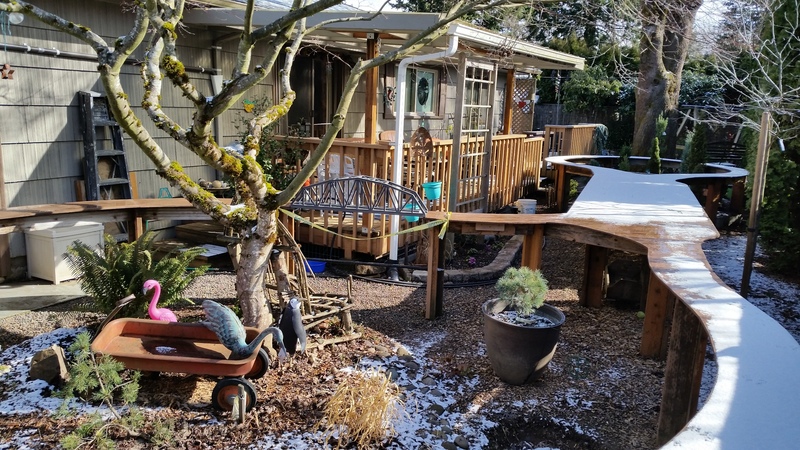 Visit the Miniforest Nursery in Mulino, OR. Their web site is at Miniforest Nursery. 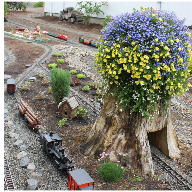 Miniforest Nursery (by Sky) was started in 1994 as an offshoot of the original Old Homestead Garden Railway. Sharon’s attention was centered on naturally small plants that would fit in our little world and stay that way over the years with a minimum amount of attention. The nursery has outlived the railroad, though you can see remains that include what was an actual half-inch replica of well known Hull Oaks Lumber, the last commercial steam powered sawmill in America. The bulk of her business is mail order, so you can get her plants all over the country. Handicapped accessible. Ground is level gravel. Construction of the Story Lines railway began in the spring of 2005. The original sub-roadbed is redwood recycled from a deck behind a house in Ashland, Oregon. As the track configuration has changed over the years, and an additional loop added, the new track simply “floats” on the ballast. The train storage shed contains a switchyard; the grade leading to it was completed this year. The track and switches are LGB. Switches on the main line are wired and controlled from the master panel. At this time, the original loop and sidings are track powered, but Story Lines now has three battery-battery-powered locomotives as well. The layout is designed to give a “peek-a-boo” effect; the train disappearing behind the landscape and then popping up for a glimpse here and there gives the illusion that the distance is longer than it really is. The buildings have been picked up at club auctions, donated by friends, or built by the owner. Future structures in the works include scratch-built models based on Sears Kit Homes from the early 1900s and Shakespeare’s Globe Theatre. The resort town of Erratic Rock began as a simple logging camp. Its name was inspired by the phenomenal variety of geologic wonders throughout the area, which have puzzled geologists and been studied by them for over a century. Not long after the camp was established, a logger discovered gold in “them thar hills”, and the rush was on. A town sprang up and was quickly serviced by a railroad. When the gold played out, and the forests thinned, Erratic Rock became a near ghost town. But thanks to the beauty of the area, and the opportunities for recreation, a wise town father named Ellingham Bodmin turned the town into a mecca for the arts. Erratic Rock is now famous for its Shakespeare Festival, its many outdoor concerts, its opportunities for outdoor recreation, and its scenic railway. It is a “green” community, with power supplied by the wind turbines along the Crater Creek gorge. Because of Erratic Rock’s relative isolation, Story Lines not only serves as a tourist attraction, but also brings supplies and people to town. Though a visitor may be lucky enough to see classic cars at the annual cruise-in, it is far easier to reach Erratic Rock by rail than by car. The following are open for tour on Wednesday, 28 August 2019. See the 2015 Summer Tour Garden Time news clip for this railroad at https://www.youtube.com/embed/TIHTpmJ7YV8. 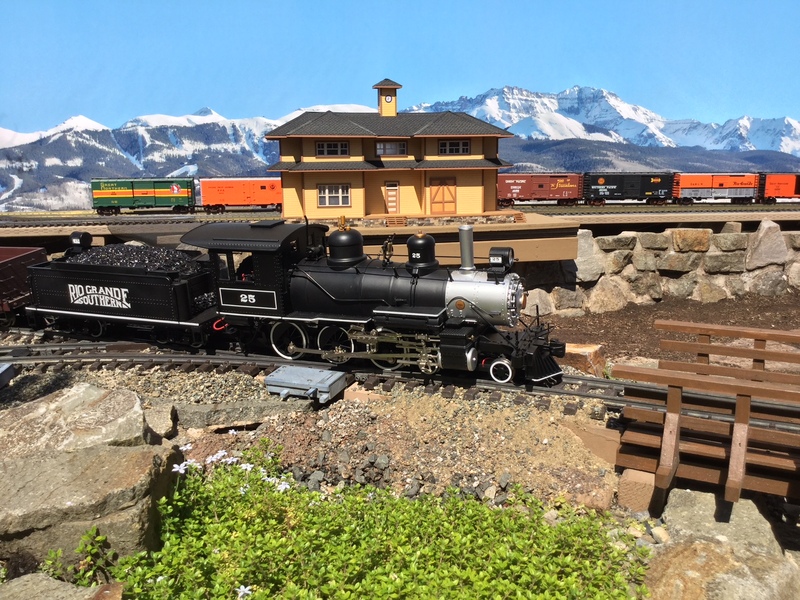 The Baker & Grande Ronde Railroad is a fictitious 1:24 scale narrow-gauge railroad that connects with the Sumpter Valley Railroad at its terminus in Baker City, Oregon. Circa 1890, during the glory days of mining and lumbering in the Oregon Blue Mountains, this small railroad ambitiously crossed the Elkhorn Range to reach its western destination of Ukiah. The 1:24 scale trains traverse six trestles and bridges that cross three rivers. A twenty-foot long, five-foot tall curved trestle near the summit transverses Freezeout Creek. There is over 800 feet of mainline on the 175′ x 60′ point-to-point railroad that was started in 2003. The forest of dwarf Alberta Spruce are pruned to represent large mature conifers; herbs and succulent ground cover create a lush forest floor, and locally gathered rock complete the landscape. The track is hand-laid and all structures and bridges are scratch-built. Engines are battery with remote control. This railroad was featured in the April, 2013, issue of Garden Railways Magazine. Open for tour on Wednesday, 28 August, 2019. No Public Restroom. Handicapped accessible. The Chicago and Far Western Railroad (C. & F.W. Railroad) nestled in the foothills of a great mountain it is the lifeblood of the two communities it serves. The railroad crosses waterfalls, canyons and through farms. The trains are controlled via Radio controls by individual operators. The tracks carry both Passenger and Freight and all engines are battery powered. The layout is handicap friendly in a large backyard in Vancouver. 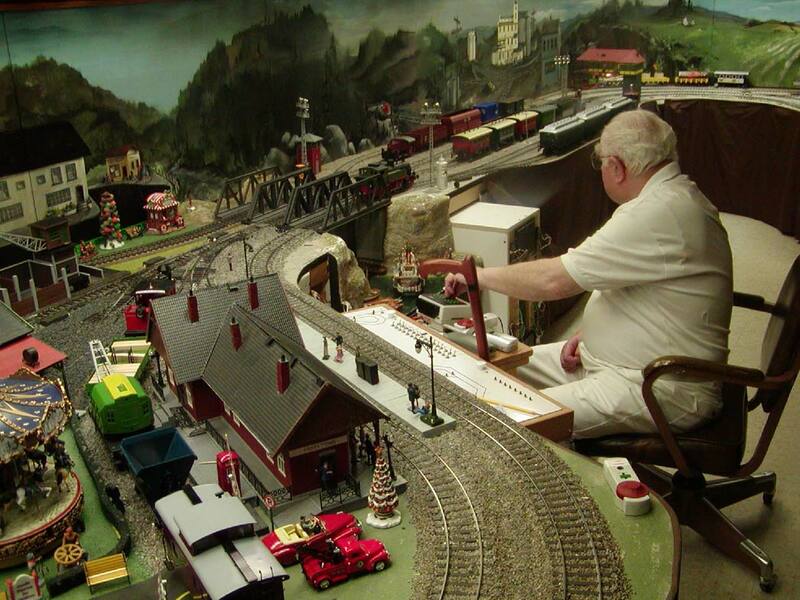 This F-scale indoor railroad was originally designed and built by Tom Miller ( previous owner) in 2004, along with a large beautiful new building to accommodate it. Artists recreated actual models of the mountains and scenery for sections of the Cumbres and Toltec Railroad (Rio Grande) under steam power. The model scenery is detailed to look like the prototype. Lights in the building were installed so that the lighting can simulate a 24-hour day of daylight, evening, semi-darkness, and dawn. In the middle of the building, is a large viewing platform in order to better see the breathtaking effect of the F-scale railroad. The many details and dioramas are visually overwhelming. What can you do with a small railroad? Lots! This 17 ft. X 55 ft. dogbone layout is packed with 2 mountains, hills, a waterfall, pond, river and lake. Set in the 1890’s Old West, the Crooked River Railroad with its 200 ft. of track, yard and spurs uses battery and track power as it services the town of Mapleton, a mine, farm, flour mill and lumber mill. Filled with deciduous and evergreen trees — some are dwarf, some miniature and some Not — but all are kept in scale by the use of Bonsai techniques. Over 150 people and animals (some home-made with Sculpey) are set in vignettes that delight the eye and bring the railroad to life. Our favorite comments? One woman said, “I want to live there.” An arborist exclaimed, “Now, that’s landscaping!” And a TV cameraman said, “The more you look, the more there is to see.”. Handicapped access is limited. No wheelchair access. This railway integrates rockwork, tunnels, bridges and wide sweeping curves to traverse its natural Cascade Foothill setting. More than 700 feet of track grading takes advantage of abundant on-site volcanic basalt rock to achieve a maximum 3% grade. The railway compliments the Douglas Fir shaded landscape while navigating a real ten-foot drop between remote mountains and lower elevation lakes. Features include an under-driveway tunnel, a spiral helix, and snaking descents from rocky ridgetops through rugged canyons to tranquil lakes. Unique accents of cascading waterfalls and massive boulders are intermixed with blueberries and flowering plants. Current and historical western US passenger, freight, and logging trains run on battery and track power with layout expansions under construction. The newly rebuilt Lake View and Boulder Railway in the NW neighborhood of Vancouver, Washington, has just that; a good view of Vancouver Lake and the railroad is surrounded by small boulders. It is made up of approximately 800 feet of single mainline track with sidings. The mainline is built around the perimeter of a large back yard just inside of a large privacy fence and adjoining arborvitae hedge. The south end of the layout crosses three steel bridges as it begins a long 3% climb up to the summit along the southern property line. It then returns back down a steep grade to the lower, level portions of the layout. At normal speeds, it takes almost 3 minutes for the trains to make a complete circuit. As many as 4 to 5 trains can run at the same time, providing that many operators are on duty. The layout is track, battery and steam powered. The owners enjoy running long mainline diesel freight and passenger trains, but also have a large collection of steam engines which run alongside their more recent counterparts from time to time. The 5 operating indoor layouts in the owner’s shop represent all scales, from the smaller Z, to the largest of the scales, including N, HO, O, and G scales. The Serrano Creek line was up and chugging by October 2017 with no foreseeable completion date. The diesel dominated Serrano Creek Line travels through a representation of life in early 1970’s. The ever-changing landscape features both scratch built, “unique” 1:24 scale kit structures and refurbished buildings that were “acquired” by its creators. The following are open for tour on Thursday, 29 August 2019. See the 2016 Summer Tour Garden Time news clip for this railroad at https://www.youtube.com/embed/9nLSOb3EG4U. Fantastic use of a crawlspace and the entire front and backyard make this a very entertaining railroad. 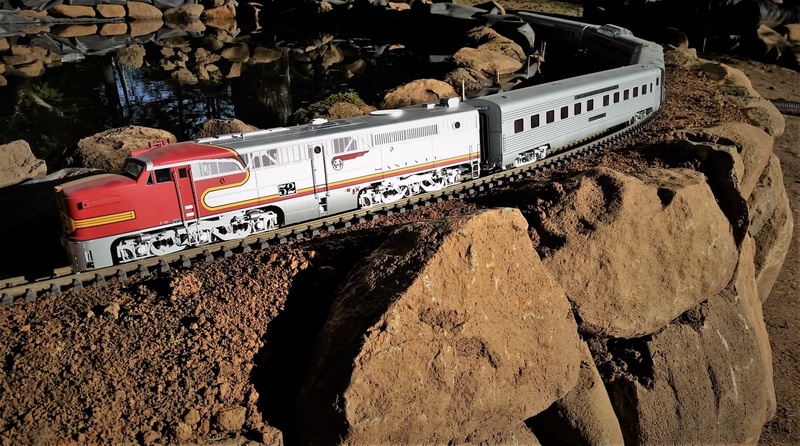 A recent addition to the mainline now traverses two waterfalls and streams in the backyard division of the Bearspaw Southern. This garden layout has over 1300′ of track, more than 100 switches, and encompasses nearly the entire residential corner lot. It can take up to 15 minutes or more for a single train to cover the entire length of the outdoor line without traveling the same track twice. This is a model of a fictional railroad connecting several imaginary Northwest towns to a region called Bearspaw. Trains are controlled via radio control by individual operators walking along with their train. Towns in different areas serve as sources and destinations for both freight and passenger operation. 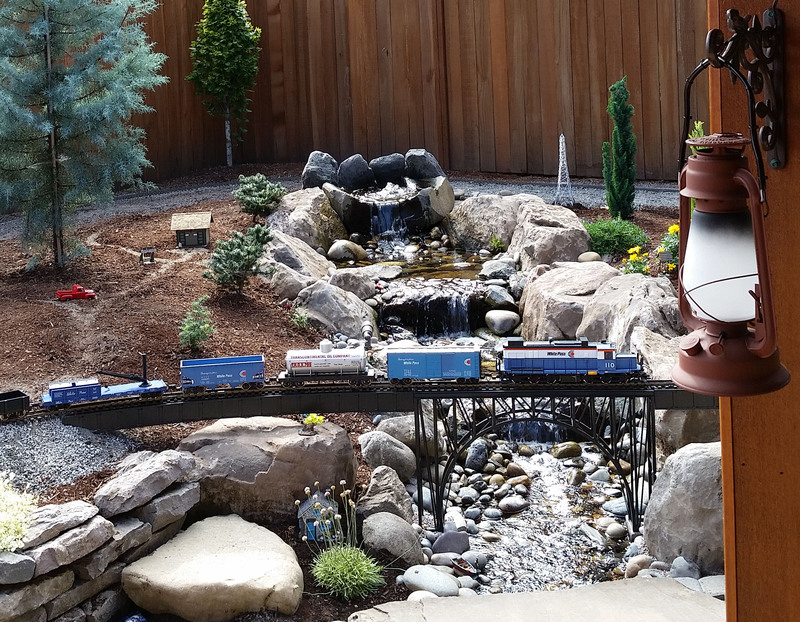 The railroad begins in the front yard garden with miniature trees, a logging scene and a waterfall. It winds around the side and back yards, through more mountains, under grape arbors, across two streams and ponds. Much of the backyard portion of the railroad runs in the shade of high trellised grapevines, blending agricultural function with miniature trains. The two ponds in the backyard are home to large Koi fish. After traversing the yards outside, the tracks tunnel underneath the house into what was once a basement “crawl space” that has been excavated and lined with stone. The outdoor section is open and viewable from sidewalks, garden paths as well as covered porch decks. The indoor division, although having somewhat limited access down a stairway, provides year-round railroading with scenes of towns, industries and switch-yards. The Bearspaw Southern serves as proof that large-scale railroading can be done in places other than just a garden and has something for every railroad fan. Open for tour on Thursday, 29 August, 2019. The layout is Not handicapped accessible. See “Jim Reardon’s On3” on Google for video. Size: 13′x31 ′ plus 10′x17′ L-shaped layout. Features scratch-built buildings, rolling stock, hand-laid track, painted backdrops, sound effects, and 95% complete scenery. Jim builds everything you see and can share the techniques he found useful as desired. See the 2015 Summer Tour Garden Time news clip for this railroad at https://www.youtube.com/embed/QR2umQL60ss. 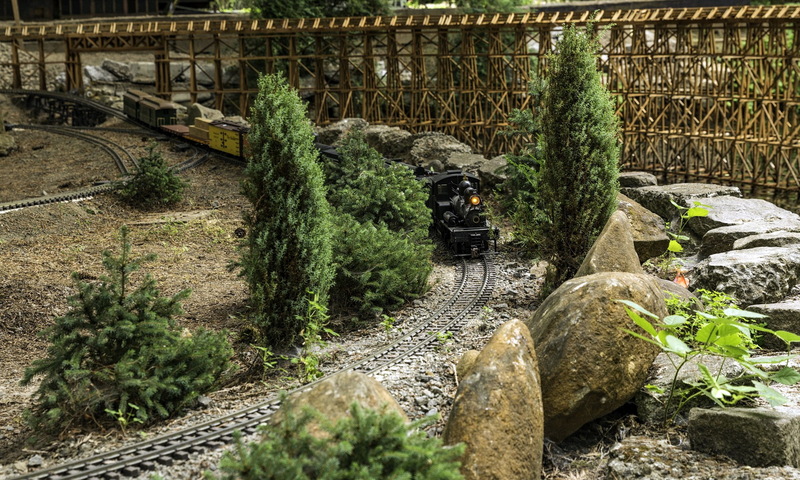 This layout was featured in the June 2014 issue of Garden Railways Magazine. The town of Lone Pine is a mythical crew change point on the transcontinental railroad. In the late 1800s gold was discovered in the near by Lone Pine Mountains. A branch line needed to be quickly built into the mountains to service the newly established mines. This branch line initially achieves a water level grade by following the Clear Water River into the mountains. At Headache Falls, the railroad diverts from following the river but the surveyors were able to maintain the same 1% grade into the mountains by blasting a series of tunnels. Due to the rugged nature of the mountains, this branch line is limited to single track operations with occasional, short passing sidings. The town of Half Way is located part way up the mountain. It consists of a small switching yard, a freight company, and a small wood products manufacturing business, all of which help to provide additional revenue for the branch line. Continuing on past Halfway, the branch line again follows the upper reaches of the Clear Water River for a short distance before again diverting to follow a canyon further into the mountains and more tunnels. The line eventually arrives at Summit Station, located near the gold mines. A small yard was built near Summit at Windy Ridge to turn the trains around for the trip back to the town of Lone Pine. Here’s some interesting specifications regarding the construction of this layout you might find handy. The MRT&T was established in 2013 and services the McCully/Powell National Forest, the small community of Rocky Top USA, and the restored gold rush town of Canyon City. Rocky Top is nestled in the mountains of the Pacific Northwest. At an elevation of 4516 feet, it is well known for its skiing and timber exports. It is summer 1959 and a typical day in the lives of the Rocky Top people. Located a short distance to the East is the gold rush town of Canyon City and since its restoration Canyon City has become a very popular tourist attraction that draws visitors throughout the region. Tourists are transported from Rocky Top to Canyon City by rail where horseback riding, rodeos and wild west shows keep the visitors entertained. Construction for the MRT&T railroad began in February 2013 and consists of approximately 480 feet of brass track mounted on 2x6 lumber. The forest and logging extension was added in 2016 and is approximately 390 feet of brass track and a 60-foot fast flowing river. Mt. Rocky Top is constructed from twenty- four 4′x8′ two-inch pieces of styrofoam and supports approximately 650 trees. 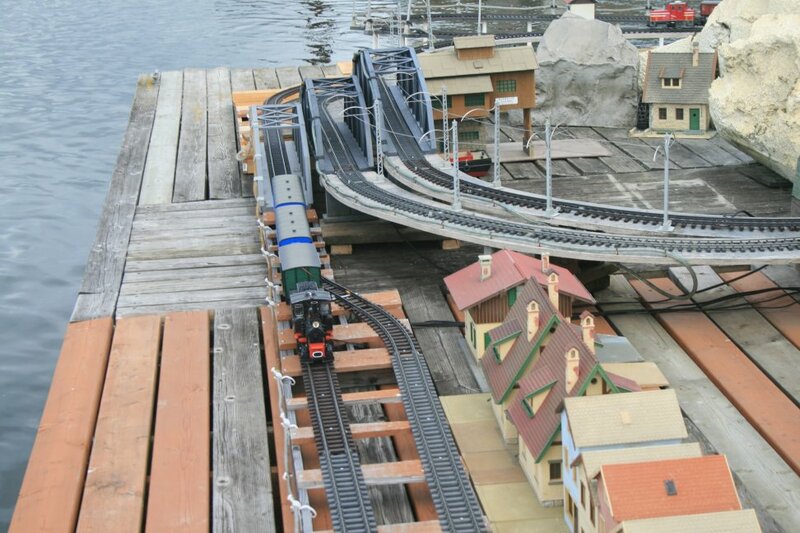 Track-powered trains are controlled from a central location while the battery- powered trains are remote controlled. The dispatcher handles route assignment and switch settings. This railroad represents what might have been a small short line railway in the Pine Valley area of Eastern Oregon that is an affiliate of the Atchison, Topeka and Santa Fe Railway circa 1935 to 1965. Steam is king, but diesels have made an appearance. Nestled under a pair of White Ash trees where it began as a simple Figure-8 in 2008, it now occupies a 50 by 40 foot raised area with 550 feet of track and over thirty switches. Two removable bridges cross a dry river bed and provide access to an island featuring a small recirculating fountain. Current plantings include a large field of sedums, some volunteer White Ash tree-lets (removed seasonally), and a small number of cypress. A small replica railway depot provides a climate controlled workspace and storage area for the Pine Valley’s locomotives and rolling stock. The Dragon’s Gate flat classification yard provides for point-to-point operation by serving as both source and destination for trains as they move along the mainline. 1. The Southern Railway models the 1950s Steam-Diesel Transition era on the SRR Division between Asheville, NC and Greenville-Spartanburg, SC, including the infamous Saluda Grade, the steepest continuous grade (averages 4.5%) in the U.S. The motive power includes several steam engines including a Southern Crescent Pacific (4-6-2) and several early diesels including an F-3 ABA consist and NW-2 switcher. 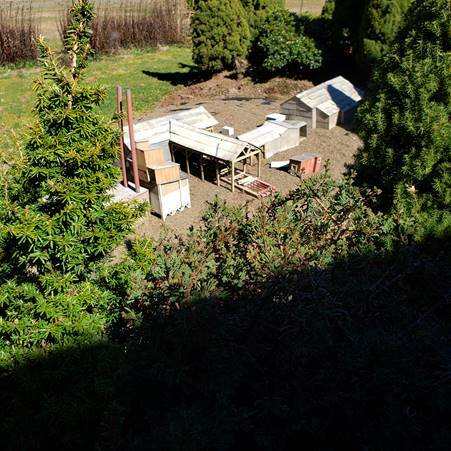 The garden layout covers one side of yard and is being expanded (work-in-progress) to include the back of the yard. The walkway and yard area is flat and handicap accessible. 2. The layout is G-Gauge, 1:29 Scale with a minimum main line diameter of eight feet. The original portion contains about 200 feet of track on a raised bed. The layout is configured as a single-track “dog bone” loop with Asheville, NC on one end and Saluda, NC on the other, operated as a point-to-point two-track main line. Construction is adding a new portion of 100 more feet with the Saluda grade and a rail yard and interchange with the SRR north-south corridor at the Greenville-Spartanburg end. There are several intermediate stops, passing sidings, and a regional yard and roundhouse at Hendersonville, NC. A helper engine is kept at Saluda. Through and local passenger service runs on a regular schedule between Asheville and Greenville-Spartanburg, with stops at Hendersonville and Saluda. A curved 200-foot (scale) trestle is located near Saluda, a pony truss bridge crosses the river near Hendersonville, and a 96 foot (scale) deck girder span is near Asheville. 3. Personal note: Rusty’s grandfather, John Baumberger, was an Engineer on the Southern Railway, based in Asheville, and operated trains on this route (including the Saluda grade) from the 1920s to 1950. This Union Pacific “short line” is graced with both shade and sun. The time is that of the late 1940’s and early 1950’s, when World War II was a fading memory and steam-powered transportation was still king of the railroads. Even so, the youngest and newest diesel-powered freight engines were slowly but surely taking the place of steam. Our short line is typical of the many small railroads that serviced towns, forest lumbering, and farming communities along the Pacific coastal ranges of the western United States. The engines and rolling stock that you see here are typical of the era. We hope that in your visit here, you will enjoy your step into yesteryear. Unfortunately, our small setting cannot accommodate handicapped accessibility. Located on a steep slope overlooking a small lake located 70 feet below, the WWWI Railroad is the result of the owner’s determination to access the rich natural resources located at various locations on the slope. A large deposit of shale suitable for the production of cement was the first project. To access this deposit and the cement plant nearby, a series of bridges and a serpentine track route was constructed. Later, a large deposit of rich ore containing silver, zinc and lead were discovered, requiring a further extension of the track. Finally, in the valley below, grain farms that formerly had to truck or wagon out the products were now accessible to WWWI lines. A series of bridges including a functioning Bascule type drawbridge 8 feet in length and a Howe Truss Bridge some 24 feet long and a total of over 1,000 feet of track have been necessary to create this railroad. Battery-powered diesel locomotives provide motive power. Structures are mostly scratch-built from plans from Brewer and others. Not wheelchair accessible. Steep stairs could make access hazardous for those who are physically challenged. The following are open for tour on Friday, 30 August 2019. 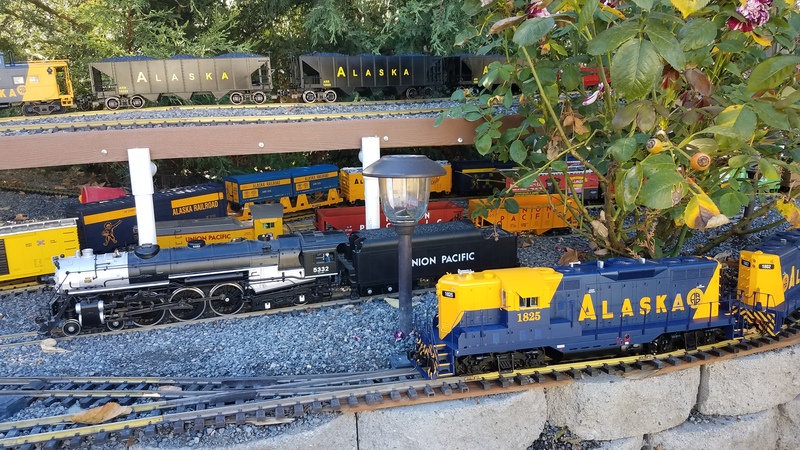 The Alaska and NW Railroad is a freelanced layout featuring locomotives and rolling stock from the Alaska Railroad (ARR) as well as Union Pacific (UP) and BNSF from the NW. The layout is track power with isolated sidings. Locomotives are being converted to battery power and sound utilizing Airwire and Phoenix Sound as time and resources allow. The basis of the design is to provide a layout to be able to run trains on a continuous loop and have trains staged in the yard. The layout began in the planning stages in late 2015 with the plan to relandscape the back yard to provide space for the railroad. The first track was laid in the spring of 2018 with the first successful train on the mainline in September of 2018. The layout features approximately 200 feet of mainline with roughly 25% of it elevated. The grade level track is laid directly on the ground using 1/4 minus gravel as the base and ballast. The elevated portions are 2x6 lumber with 1/4 minus ballast. An 8 foot long bridge made from a full scale section of rail begins the elevated portion of the railroad. The railroad is very much still a work in progress with future modifications that include yard expansion, a covered storage area and scenery and building addition. A possible extension into the garage is being considered. Trains leave the yard on their way toward the bend meandering along the front retaining wall allowing viewers to be up close to trains as they run by. Trains wrap around the bend on their way up to the elevated portion crossing the long bridge before appearing once again up close to railfans. Trains then disappear behind majestic Cypress trees only to reappear through the remains of one of their fallen compadres, then back around the bend then wrapping around the Cypress trees again and back to the yard. Open for tour on Friday, 30 August, 2019. The railroad is not very handicap accessible as there is a long gravel walkway. Restrooms are not available at this location. This railroad is loosely modeled on the Creston, Iowa, Division of the Burlington Route (CB&Q) from 1935 until 1969 before it was merged into the Burlington Northern and later the BNSF railroads. The motive power is primarily 22 various diesels of the era including the Pioneer Zephyr (1935) and the last-purchased SD45 (1969). Approximately 600 feet of mainline track runs around three sides of the house and there is a large switch yard in the town of Creston. One route in the front yard crosses a 16- foot gap on a plate girder trestle and through an eight-foot truss bridge. A second route travels over a 60-foot poured concrete viaduct. Several of the 71 buildings and structures are built from scratch and are actual scale (1:32) models of buildings in Creston, especially the 1898 railroad station and auxiliary buildings. The Altoona Playland miniature amusement park is just for fun. Wheel chair accessible with assistance. Camp Creek Railroad was started in 2007 under 3 large Scotch pine trees. It took less than 6 months to realize that this location was a bad idea because of the sap and lots of needles. The Grandchildren let Poppy know in no uncertain terms that the cleanup was difficult—the trees had to go in their minds. They had no idea I would take them to heart and remove the trees in the summer of 2011. The road bed was re-configured to allow one track loop to run through the biggest stump. Opening the area up to more natural light was great for the survival of the existing plant material and the addition of Stepables (ground covers). Our neighbor installed a row of Emerald Green Arborvitae along their property line to provide an evergreen backdrop for the Camp Creek Railroad. Plant materials, like grandchildren, do grow if they are fed properly. During the spring of 2012, the existing driveway was re-configured to allow for the expansion of the railroad. We now have two closed loops. We now have a double trestle bridge that allows both trains to pass one another side by side. All together we have 390 feet of track and two spurs. A 54″ tunnel was added made out of 10″ diameter drain pipe. Also Camp Creek was added. Camp Creek is a work in progress and will always be just that. Thanks for coming by this year to see what we have been up to these past couple of years. This 1925 layout loosely represents Northern Pacific’s Coeur d’Alene branch line to Wallace Idaho and the surrounding area, which is the richest silver mining area in the world. The railroad climbs a 2 percent grade up Canyon Creek through Gem to the town of Burke, ID. To keep the grade at only 2%, engineers had to drill 3 tunnels (totaling 90 feet) through the hard rock and cross the Canyon Creek (a 50 foot river with 200 gallons per minute of white water) to reach the mining town. The 10-track classification yard in Wallace is in the middle of the layout. It has a seven stall round house, engine servicing facilities, and an ice house. Leaving Wallace, the track passes through Mullan, ID, before climbing Lookout Pass on its way to Missoula, Montana. The climb to Lookout Pass is actually off the layout. After leaving Mullan, trains move into the staging yard in the train shed where equipment is stored. (When running trains for visitors, the trains will pass through this staging yard, and come out on the Nine Mile Creek branch, returning to the Wallace Yard in a large loop for continuous running). Four passing sidings are necessary to allow trains to pass in the opposite direction on this single track layout. A logging branch line begins in Burke and leads to a logging camp where the Heisler is turned on a wye before returning with its loaded log cars destined for the lumber mill at Gem. The layout was built for operations with a dispatcher, a yard master, freight cars with waybills, and a time table for a passenger train. The layout was started in 1997 and has about 800 feet of track with 60 turnouts. A bathroom is available. Layout is handicapped accessible. We built an elevated railway in an existing garden, working with existing trees and plants. It is an example of what can be done in a very small space with only about 200′ of track. It consists of two loops at either end connected by a single line track. The “Garden Loop” has a waterfall, trees, small river, bridges, village and a wye connected to the main line. The other end also has a wye, turntable and railway yard. Two engines, (Iuki) live steam 0-4-2 “Plantation” pulling Isle of Man prototype coaches and wagons. Thomas the Tank (battery power) pulls two coaches and occasional LGB wagons. Remote control for both the steamer and Thomas is via a spread spectrum 2.4 GHz analog controller using off-the-shelf (cheap!) airplane/car/boat components. The garden is an accessible, flat, paved surface. No toilet facilities. Our lay-out consists of 5 raised garden beds or islands, connected by bridges. One island is home to Hotel Leupold and the Serenity Garden. A small village and main train station are on another island. One island has rustic rental cabins as well as a tourist train ride — der Schwanzug. Wild Platz is home to dinosaurs and dragons. Our newest island is Weinacht Welt with Christmas displays and a trolley. The time period of the lay-out is now and is located in a small part of Germany. It is a mixture of realism and whimsey. Some figures are human and some are not. Most trains are LGB and are track powered. Due to lawn and uneven ground, our lay-out is not handicap accessible. A restroom is available. The following are open for tour on Saturday, 31 August 2019. 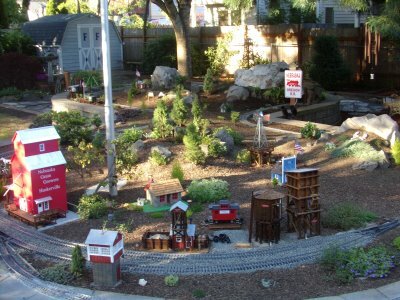 Situated in a grove of five large cedar trees, Cedar Grove Railway gets its name from the small town and environs displayed on the layout. Cedar Grove is a fictional small community situated in the Canadian Rockies on the Canadian Pacific mainline during the transition from steam to diesel power. It was a railroad town and a centre for three local industries, namely grain, lumber and canning and was known for freight trains specializing in serving those industries. In addition, its location on the mainline made possible a much more regular and prestigious passenger service than its small size would warrant, including the transcontinental “Canadian”. Cedar Grove Railway has about five hundred feet of stainless steel track laid in a manner that allows trains to pass and to cross over each other. The layout is track powered with separately controlled blocks, with power supplied through a 25 amp power unit, sufficient to run three long trains at once. Construction began in September 2005. Open for tour on Saturday, 31 August, 2019. We are an HO scale club founded in 1947 and dedicated to the portrayal of the rail lines between Portland, Oregon and Wishram Washington. 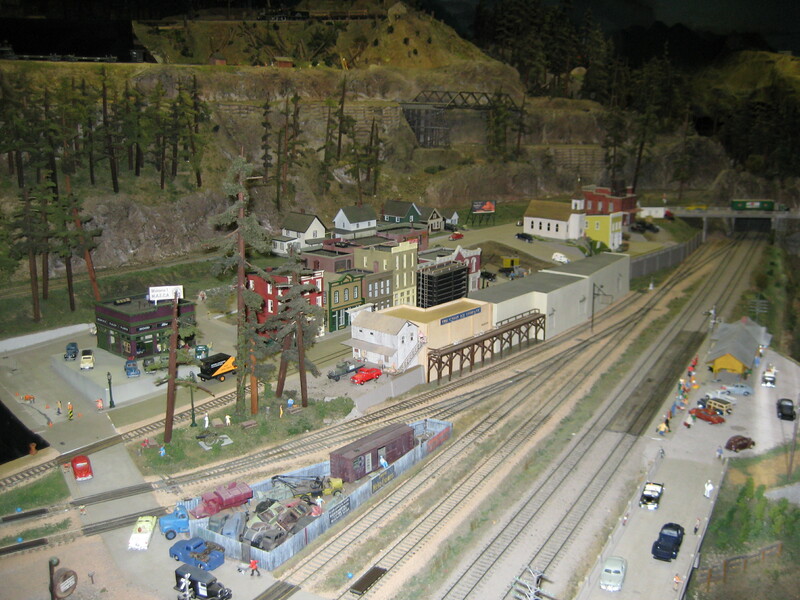 Our 60′x70′ layout features examples of scratch built landmarks of the Columbia River area. 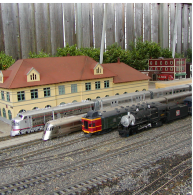 Our models of Portland’s Union Station, Crown Point and the Multnomah Falls Lodge are fine examples of the art of realistic modeling. Check out our Lumber mill with a working Log dump and fiery Wigwam Burner. In the Maryhill area be sure to notice the accurate Stonehenge Peace Memorial recently produced by 3D printing. Pay close attention to the details and you will find boys riding soapbox cars, a raging forest fire, Native American fishing platforms, and of course be on the lookout for Sasquatch! Our club members run both steam and diesel. They are quite adept at modifying engines and cars to portray actual rolling stock. With 3D printing we have a wonderful model of the Amtrak Cascades. And notice the fire boxes blazing away on many of the Steam Engines. With waterfalls and forests, neon signs and trolleys, our layout has something for everyone who loves the Pacific Northwest and the history of Railroading. The Nebraska Oregon Railroad is a representation of the 1930s. At one end of the above-ground layout is the town of Huskerville, Nebraska, which is a small town near Lincoln. At the other end is the small town of Bates, which was a mill town at the end of the Sumpter Valley Railroad in Eastern Oregon. The name of the railroad was picked as these two places meant something to the owners. Mike was born in Nebraska, and Randi was born and raised in Eastern Oregon. This line was started in 2016, but has been the dream of the owner for much longer than that. We wanted a layout that could show that a small intimate layout can be as much fun as a large one. A few buildings have been added and landscaping done since the tour last year. Most all of the buildings have been designed and built by the Chief Engineer, Mike Fisher, with the landscaping projects being the design of the CFO, Randi Fisher. The railroad is still in the “construction” mode but we want visitors to see our love for the hobby of Garden Railroading. It is dedicated to having a great time and enjoying the fun the Nebraska Oregon Railroad has to offer. This is an indoor whimsical no 1. scale (1/32) railroad, with lots of lights, sound and animation. It is a tourist and freight railroad, serving the raucous Partytown, the quieter Farmdale, and the recent extension to Vineyard Village, aptly named for its vineyard and wineries. Residents and visitors cover a wide gamut, including Alexander Graham Bell. Sherlock Holmes and Watson, Laurel and Hardy, Popeye and Olive Oyl, and Jack and Jill. This year the carnival has come to Partytown and the circus has come to Farmdale. The sidewalk on the right side of the house allows people with wheelchairs to enter the lower level to view the layout. Visit Staver Locomotive in Portland, OR. His web site is at Staver Locomotive. Housed in a 16000 sq ft warehouse on an acre of land in the heart of industrial NW Portland, Staver Locomotive was built to showcase Larry Staver’s collection of live steam locomotives. Featuring both indoor and outdoor loops, the track itself is dead level, with broad curves on super elevations. The layout is a classic form used in the smaller scales, a folded dog bone, forming 3 circles for steaming, operations or just viewing. The track is all hand built and at waist height. It can accommodate any scale, self-powered locomotive running on 45mm track. The track is non-powered, made of steel bar, 1/8 by 3/8 by 12′, and the ties are made of cedar, notched to the correct gauge. The switches for the tracks are also handmade and manufactured in house. The landscape is minimalist to highlight the movement and function of the engines. The warehouse itself boasts a number of additional facilities to fabricate, and showcase their latest projects, inventions, and designs. It has become a growing resource for the Portland train community to collaborate, inspire, and share their love of trains. In the spirit of his father’s love of hosting events, Staver Locomotive has also been hosting spring and fall steam up for the small scale live steam community for the past 12 years in addition to more recent operations sessions with RCGRS members. On-site Restrooms available. Handicap Accessible. Welcome to the Swiss Flats Railway (SF Ry.) a small Pike with a huge water feature. The SF Ry. can be multi-modal with short headways, intense rail traffic, 2 major junctions using air drive switches with up to 4 train operators fighting over the right-of-way controlled by 1 harried dispatcher. Or the SF Ry. can have 3 trains loop lazily each in its own circle of solitude. Or 1 train can traverse all 3 loops which is very handy for cleaning track. The SF Ry. is loosely based on travels in Switzerland on the Rh B and other narrow gauge railways. Steam, diesel and electric motors may be seen negotiating European close quarters scenery with mountainous grades and overhead catenary. The SF Ry. is built upon a 16′ x 48′ float attached to a member’s floating home on the Columbia River at North Portland Harbor. All manner of transportation may be seen here as the SF Ry. is within sight of the BNSF swing bridge (MP 8.8 Fallbridge Sub), I-5 Road Bridge with historical ships moored across the channel. Visiting the SF Ry. will require parking inside the Jantzen Beach Moorage (JBMI) gated community, walking down a 20% grade ramp, and along 800 feet of floating walkways. Please wear comfortable shoes, secure your car keys, cell phones and other valuables because the water is deep and divers are not standing by.